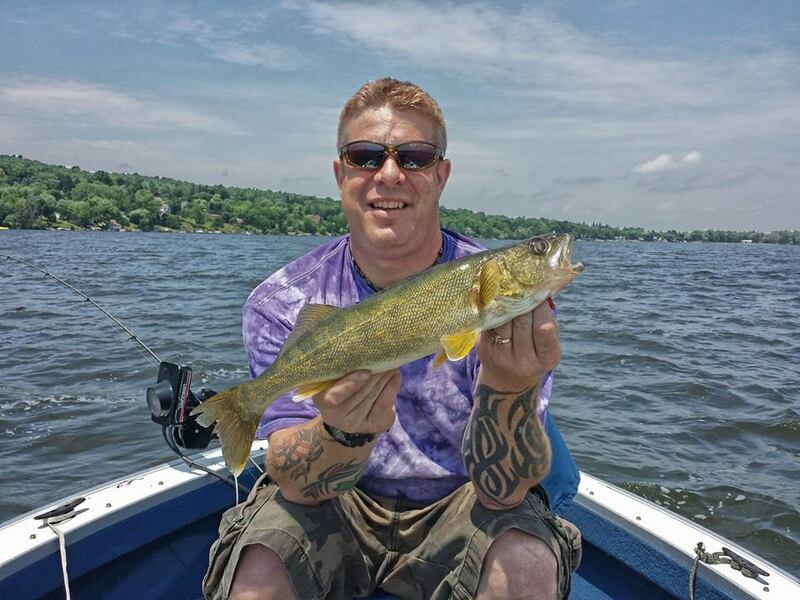 Kenny Ledgerwood with his Walleye catch on Lake Somewhere! We all have seen the popular fishing shows. A guy puts his favorite lure on the end of his line and casts out into the lake waiting for that unpredictable quick strike from a finned opponent beneath the water’s surface. Adrenaline flows with each cast and anticipation of the hit makes the palms just a little bit sweaty. And then it happens. You hear a loud “yeah!” There is a balancing act going on in the boat as the battle between fish and man ensues. Sometimes man gets so pumped he makes a mistake and the fish gets off the hook. Man swings his reel and rod in utter disgust. Fish wipes his brow and swims away hurriedly swearing not to bite another lure that looks like that. And the battle is over as quickly as it started. 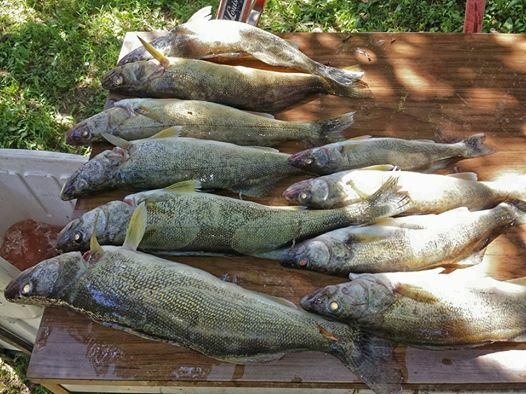 Yes, this is a catch that makes amateur fisherman jealous- Kenny Ledgerwood shows us how it’s done! This is not the case with New York’s finest fisherman and Unknown Cook, Kenny Ledgerwood. When Ledgerwood is not working, he is skillfully fishing his favorite spots reeling in whatever fish he hooks on the end of his line. The kicker, however, is not how skillful Ledgerwood is at fishing. What amazes us all is what he does with these fish when he gets them home. Kenny is just as skilled at preparing his catch for splendid fish dishes as he is at catching them. “What this guy does with fish makes me jealous”, says one member of The Unknown Cooks. Kenny narrowly missed being the winner of the recent online Unknown Cook challenge where members vote on each other’s dishes based solely on presentation. If you want to know how Kenny Ledgerwood takes his fish from the lake to the table, you can contact him at The Unknown Cooks group. With you being lucky and cordial, Kenny may clue you in on his top secret fishing process and recipes for a fish dinner success. But please be nice. The guy is a Marine! Kenny Ledgerwood – From the lake to the table. 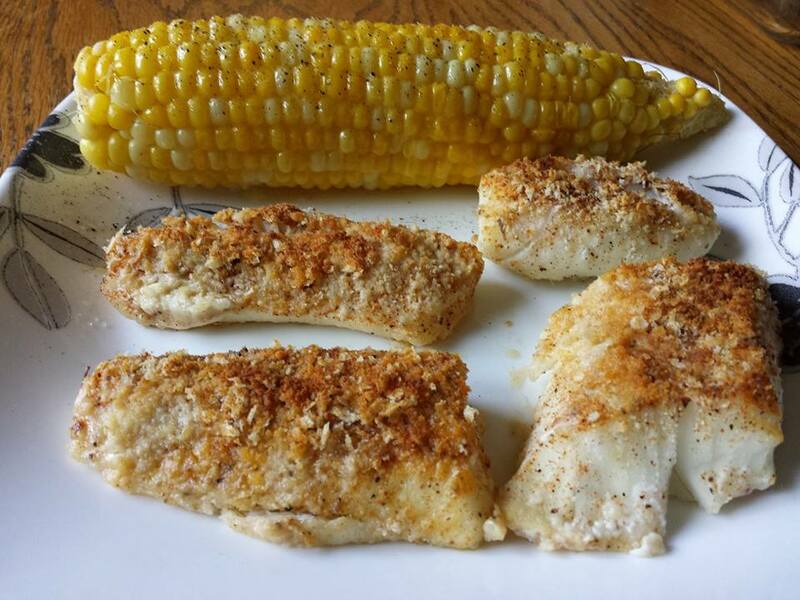 Cajun Parmesan Romano Crusted Walleye. This dish is lovely! Posted on July 14, 2014, in Uncategorized and tagged articles on cooking, baked salmon, fishing in New York, fried fish, fried tilapia, fried Walleye, grilled fish, grilled tilapia, grilled walleye, lake fishing in New York, unknown cook, walleye recipes. Bookmark the permalink. 1 Comment.